Indexed in: Book Citation Index, Science (BKCI-S), Chemical Abstracts, BIOSIS Previews, EBSCO, Ulrich's Periodicals Directory. Insulin-Like Growth Factor Receptor Inhibitors: Categorical Lack of Efficacy or Lack of Personalised Medicine? Topics in Anti-Cancer Research covers important advances on both experimental (preclinical) and clinical cancer research in drug development. Major developments in the fields of oncology are covered including mechanisms, tumor and stem cell biology, metastasis, tumor suppressors, cancer drug targets, drug clinical trials, cellular and molecular pathology, genomics and genetics, diagnostics, translational therapeutics, tumor immunology, and cancer prevention and epidemiology. Topics in Anti-Cancer Research is an essential e-book for oncologists, pharmaceutical scientists, clinicians and researchers in other related disciplines. 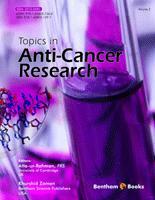 The first volume of Topics in Anti-Cancer Research comprises comprehensive chapters contributed by eminent experts in their respective field, who have also earlier contributed to and published in Recent Patents on Anti-Cancer Drug Discovery. Nicolas et al. present the mechanism of action of miRNAs, identification of oncogenes and tumor suppressor genes in cancer diagnosis and treatment in Chapter 1. Recent studies on a new class of negative regulators involved in the repression of gene expression have also been reviewed. Chapter 2 by Hewish et al. focuses on preclinical studies, clinical trials and recent data on insulin-like growth factor 1 receptor inhibitors i.e. figitumumab (CP-751,871), cixutumumab (IMC-A12), ganitumab (AMG-479), dalotuzumab (MK-0646), robatumumab (R1507), the IGF-1R tyrosine kinase inhibitors linsitinib (OSI-906), XL228 and AXL1717 as potential target for cancer treatment, and newly developed agents, including the IGF-1/IGF-2 neutralizing antibody MEDI-573 for determining the resistance and efficacy. Heparan sulfate proteoglycans are present at the surfaces of all cells and are involved in the modulation of various molecular signaling pathways related to tumor progression. Yip et al. discuss the recent patented use, clinical trials and regulation of novel inhibitors heparan sulfate proteoglycans as therapeutic targets for the treatment of breast cancer, which is one of the primary causes of female deaths all over the world. New adjuvant therapies for the treatment of renal cell carcinoma after surgery are described by Buti et al. in Chapter 4. Recent Phase III adjuvant trials are also briefly reviewed. A comprehensive review of the recent targeted therapies in clinical practice to treat patients with metastatic unresectable renal cell carcinoma and drug-associated complications (bevacizumab, sorafenib, sunitinib, pazopanib, axitinib, everolimus , emsirolimus, and axitinib) is presented in Chapter 5 by Seront et al. Sugarbaker et al. describe the recently available theoretical medical information on the use of intrperitoneal gemcitabine applicable to patients with resected pancreatic adenocarcinoma. Budillon et al. focus on recent approaches of p53 as anticancer therapeutical target and their understanding to restore p53 function in cancer. In Chapter 8, Barth et al. have presented an overview of the current developments in the field of siRNA/shRNA delivery and present progress of efficient small RNA delivery methods, pharmacokinetic properties to promote their cellular uptake, their advantages and disadvantages and the corresponding clinical trials. Masetti et al. present a review on the treatment of acute myeloid leukemia in children with recently patented novel molecularly targeted new drugs i.e. monoclonal antibodies, inhibitors of signalling molecules, proteasome inhibitors and epigenetic agents. Analysis of the previous published preclinical data and the clinical trials are also discussed in Chapter 9. Chapter 10 by Robak et al. summarizes the current understanding of the mechanism of action of cladribine 2-CdA in hematological malignancies, studies on recent pharmacokinetics of different patented pharmaceutical formulations, ongoing trials and potential future applications in the treatment of hematological malignancies. Raza et al. address new development and recent clinical trials on Cetuximab, tyrosine kinase inhibitors (gefitinib and erlotinib), Vandetanib and EGFR for treatment in patients with locally advanced head and neck squamous cell cancers (HNSCCs) in Chapter 11. Recent patents on hypoxia-inducible factor 1 alpha, mesenchymal-epithelial transition factor, insulin-like growth factor or the PI3K/AKT/mTOR pathway, and farnesyl transferase inhibitors that have been used in the management of HNSCCs are discussed. Ricardo De Souza Pereira discusses comprehensive recent patents and scientific literature on anti-cancer effect of anti-inflammatory drugs in Chapter 12. Resveratrol and SB-73 and the derivatives are selective COX-2 inhibitors possessing anti-inflammatory and anti-cancer properties. The application of NSAID in cancer treatment has also been reviewed. It is hoped that the present volume will be of interest to a large number of medicinal chemists, pharmacologists, clinicians and medical doctors interested in learning about current frontiers in cancer chemotherapy. The editors wish to express their sincere gratitude to Mr. Mahmood Alam, Ms. Raheela Anjum, Ms. Iffat Shaheen and Mrs. Rafia Rehan, the reviewers and all colleagues for their assistance in the finalization of eBook. Regional Campus of International Excellence "Campus Mare Nostrum"